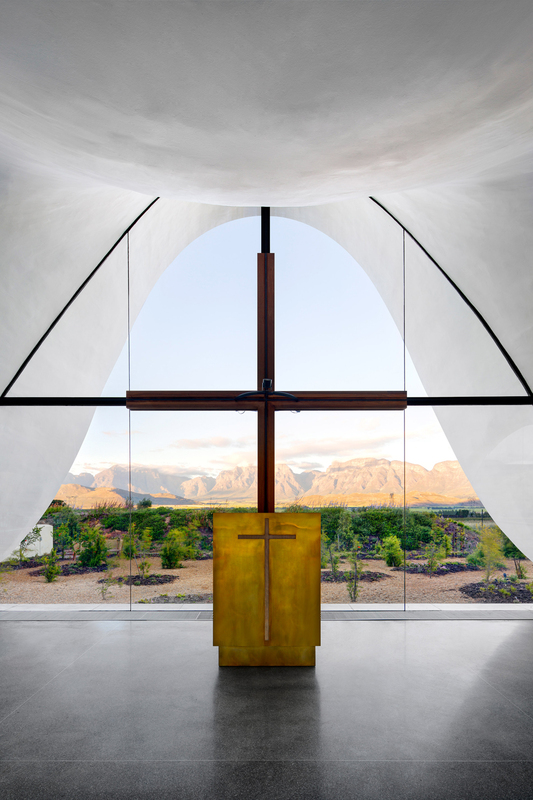 UK practice Steyn Studio worked with South African studio TV3 Architects to design the Bosjes Chapel, which is located on the Bosjes Farm in South Africa’s picturesque Witzenberg district. 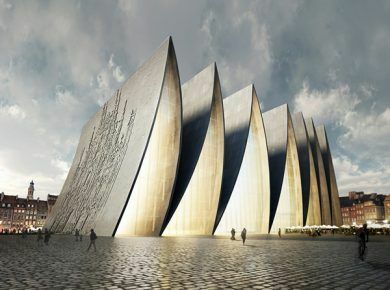 The surface of the cast-concrete roof rises and falls to create a sinuous outline around all four facades. At points, the roof form dips down to almost touch the surface of a pool surrounding the building, but lifts dramatically at the four corners. Where the corners of the 420-square-metre building lift upwards, they reveal full-height glazing embellished with tall cross-shaped frames. One of these cross-shaped frames takes the place of the crucifix that traditionally adorns the walls of churches. A golden pulpit is stationed directly in front of it. The bulbous undulations in the centre of the roof coupled with the raised planes at the corners lend it a wing-like appearance. The architects drew inspiration for the form from the biblical passage Psalm 36:7: “How priceless is your unfailing love, O God! 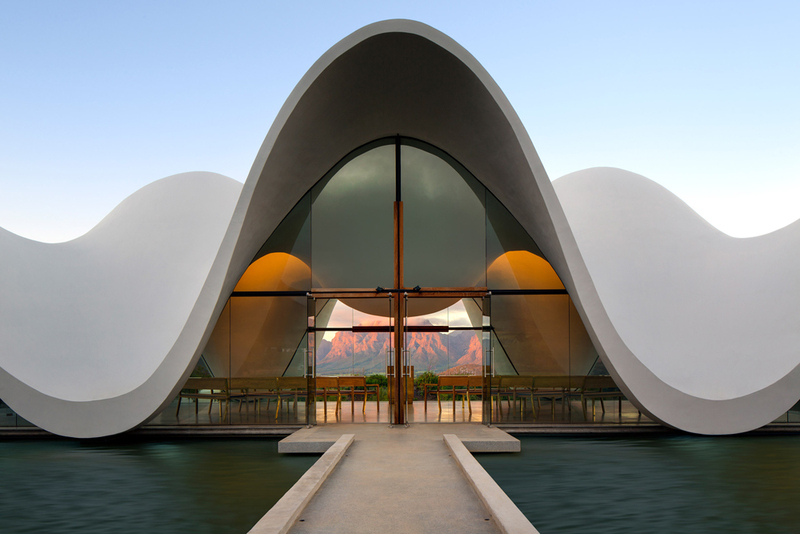 People take refuge in the shadow of your wings.” “Its serene sculptural form emulates the silhouette of surrounding mountain ranges, paying tribute to the historic Cape Dutch gables dotting the rural landscapes of the Western Cape,” said Steyn Studio, which is led by South-African born Coetzee Steyn. The single-storey building is elevated on a plinth that stands level with the water, giving it the appearance after dark of hovering just above the pool. 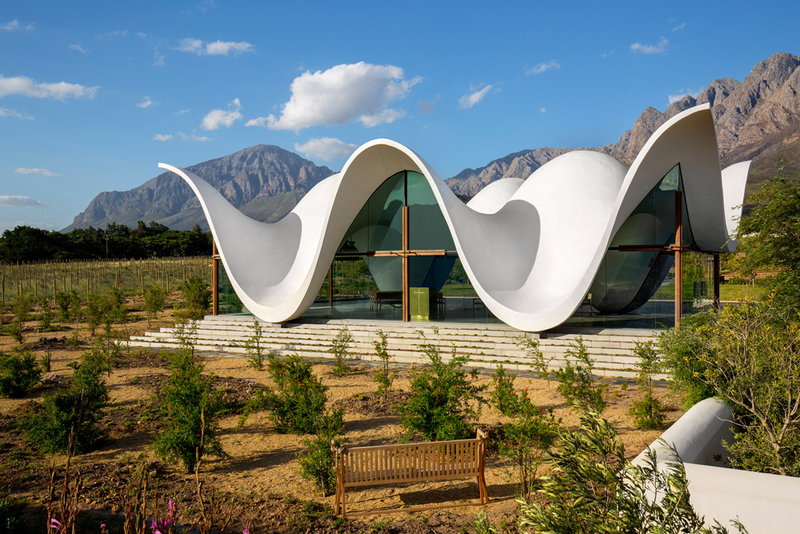 “The crisp white form is conceived as a lightweight and dynamic structure which appears to float within the valley,” added the architects. “A reflective pond emphasises the apparent weightlessness of the structure.” Inside, shadows are cast by the uneven surface of the white-washed ceiling, and the sunlight is reflected by the polished terrazzo flooring. 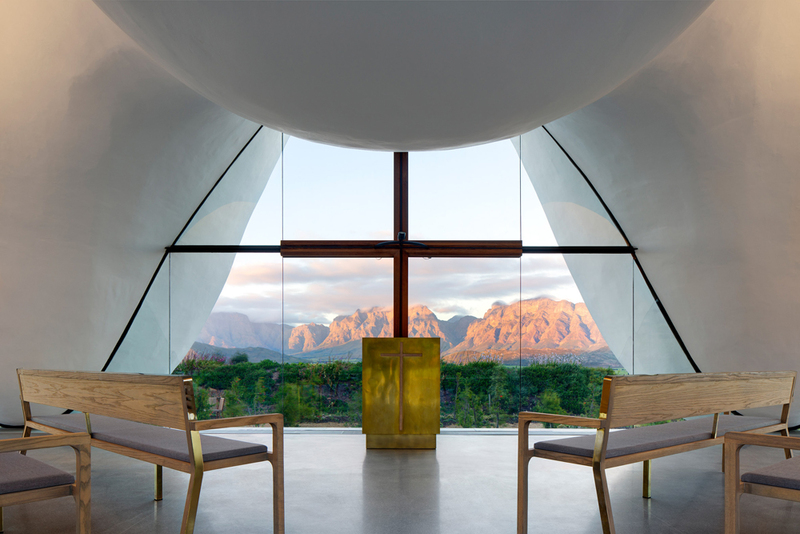 Simple wooden benches with dark blue padding are positioned on either side of a central aisle, which extends out into a jetty across the reflective pool to link the chapel with the vineyard and pomegranate orchard planted around it. To help keep the space free from unnecessary obstacles that might detract from the views, functions are concealed within the base of the building.